An Indian Muslim died of his injuries after a group of men transporting cattle were attacked by members of a suspected cow protection vigilante group. BBC Hindi’s Nitin Srivastava travelled to the victim’s village in the northern Indian state of Haryana. Villagers jostle to get a glimpse of the injured young boy who has just returned from the hospital. Azmat, who only uses one name, is lying on a cot inside a small courtyard. He has a fractured rib, multiple clots in the left eye and several lacerations on his arms and stomach. But by all accounts, he is lucky to be alive. Azmat, along with four others, was attacked by suspected cow protection vigilantes as they were transporting cattle they had purchased from Jaipur in the northern state of Rajasthan back to their dairy farm in neighbouring Haryana. “Despite having legal documents we were pulled out on the streets, beaten by sticks and the crowd was shouting for us to be burned alive. If the police had not come and rescued us, all of us would have been dead,” he told BBC Hindi. The cow is considered sacred by India’s Hindu majority, and killing cows is illegal in many states. Last month, the state of Gujarat passed a law making the slaughter of cows punishable with life imprisonment. In 2015 a Muslim man was beaten to death in Uttar Pradesh after reports that he had beef in his fridge. Since then, there have been regular reports of cow protection vigilante groups attacking people transporting cattle across the country. In this case, the men say that the cows they had bought were not for slaughter, and were for dairy purposes instead. All five men were rushed to a nearby hospital, but one man, Pehlu Khan, did not survive. He succumbed to his injuries three days later in hospital. At his home, we met his family who had just returned from his funeral. 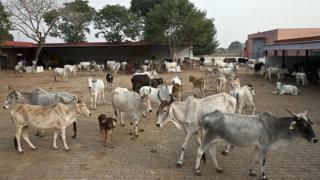 “As buffalos on sale in Jaipur were beyond our budget my father advised us to buy five cows and four calves. Ramadan is near and he thought this would enhance milk production as it is our only source of income. Who knew he had made the biggest mistake of his life,” a sobbing Irshad Khan, Pehlu Khan’s 20-year old son, said. He was also helping transport the animals when the attack took place. “Who will return our father to us? I couldn’t meet him after the attack and could only see his dead body. My mother and grandmother haven’t eaten for the last four days. Who will compensate for their loss?” he asked angrily. Police have arrested three men on the basis of a mobile phone recording of the incident that has gone viral on Indian social media. “No one will be spared and we are in process of identifying the attackers,” Ramesh Chand, a senior police official, told BBC Hindi. However, they have also registered a case against the survivors of the attack for “illegally transporting cows”. “We had all the documents and there was nothing to hide. Police can verify the sale from the government facility,” said Irshad Khan. Vigilante groups who portray themselves as protectors of cows have been active in several states. 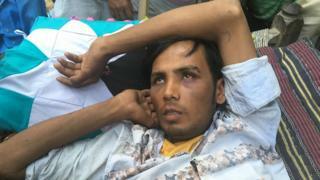 India’s Prime Minister Narendra Modi last year criticised the vigilantes, saying such people made him “angry”. But this has not stopped attacks against cattle traders. Meanwhile almost 80 miles (128km) from the village, where the men were attacked, not many were willing to speak about what happened. Some said they were “unaware” of the incident, while others said they wanted “the police to investigate”. But amid considerable tension in the area after the deadly attack, some fear more incidents cannot be ruled out.